Mermaid Party Decoration, Glitter Gold or Silver Mermaid Confetti Under the Sea Confetti, Birthday Party 50 Ct. Perfect for your mermaid/under the sea theme party. Mermaids.....Shown in glitter gold (PLEASE NOTE: White on reverse side). Material: Cut from high quality card stock. 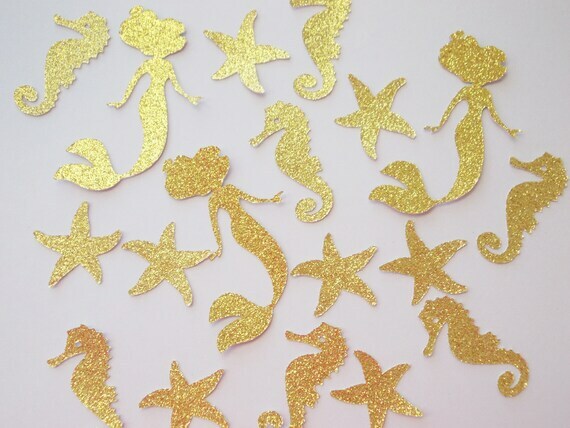 Size: Mermaids...2.5" x 1.5", seahorse 1.5", starfish 1.25"
Colors: Gold glitter (white on reverse side). Woodland Animal Confetti, Girl Baby Shower, Hedgehog Deer Fox Bear Rabbit Squirrel Birthday Party Decoration Table Confetti 100 Ct. Bow Tie Baby Shower Decorations, Little Man Boy Birthday Party, Navy and Gray Bow Tie Cutouts, 2" or 3" Bow Ties, Party Confetti, 50 Ct. Under the Sea Confetti, Nautical Party Decoration, Shark, Jellyfish, Crab, Starfish Party Decorations, Table Confetti, Table Decor, 80 Ct.
Tribal Party Decoration, Tee Pee Arrow Feather Confetti, Blues & Orange TeePee Tribal Confetti, Boho, 80 Ct.